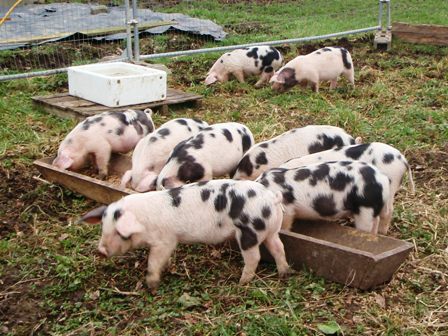 The Gloucestershire Old Spots breed of pig was awarded Traditional Speciality Guaranteed (TSG) status on 18th June 2010. This website is dedicated to providing all the information that anyone Consumers, the Meat Trade, Farmers & Producers, the Media and Students needs for a full understanding of what is involved and the implications. Left: News of the award spread quickly! Right: Secretary of State for DEFRA, Caroline Spelman MP, announced the award of the TSG at the Three Counties Show on 18th June 2010. To her right is Club President, Dave Overton and on her left is the Club’s Secretary, Richard Lutwyche and with the GOS pig is the then Vice-Chairman of the GOSPBC, Mrs Anne Nicholls. To be so recognised by the EU Commission is something very special reinforcing the wonderful qualities of meat from pedigree GOS pigs. Negotiations by the Club took 11 years and involved in depth analysis at Bristol University but it all proved worthwhile in the end with the announcement that Traditionally Farmed Gloucestershire Old Spots Pork was indeed, something very special – and unique! So what is a TSG? : Click here for more information. Producers of TSG GOS Pork Complying with the TSG Specification The GOS Pig Breeders Club publishes the full database of approved breeders and herds. It is available here. Left: The ‘grandfather’ of the breed, George Styles, (right), inspecting some finishers. Right: This pair of GOS pigs were prizewinners at the Smithfield Fatstock Show in 1929 for Jim Sherriff.